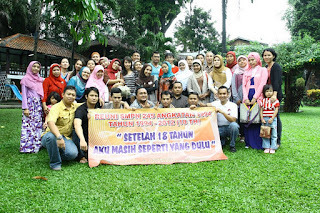 The day was came, sunday, January 15 2012, the reunion of SMPN 245. That was date, we, students of that school made a reunion in APSG Restaurant, Situ Gintung, Ciputat, Tangerang Selatan.The restaurant is wide, green and has kids playground, a beautiful restaurant i think. It was an 18-year reunion after our graduation. I came with my family, my wife and my 2 kids at about 11.30 AM. The place was still quiet, only some friends who also as the organizing committee members there.They came before me prepared the place. When i came, the place was ready but still some little preparation seem in some corner and i as a member of the organizing committee too help the rest of preparation. While, My kids and my wife played in kids playground eagerly. Then, one by one, the friends came in the place, alone or accompanied by his/her own spouse and children. We meet with our old friends eagerly. Some of us had not meet each other for some years, of course we were very pleased and surprise. We still knew our friends because our long memory is still good :). At about 13.00, we had a lunch together, the food was delicious and at about 13.30, the teachers and school staffs came in the place, Masya Allah .... the teachers who had taught us 18 years ago came in and met with us again. The situation was cheerful, fun and impressive. Many teachers did not recognize us, it was reasonable, because it was a long time ago , 18 years ago had not a short time and so many from us had changed physically and face. Oops, there was one teacher still knew me ... ow how happy i am :). We were gathered and listened a speech from the chairman of the organizing committee, Wirda Kamalia, a speech from teachers, represented by Ibu Ida Dravida (She taught us PMP) and a testimony delivered by Irma. After that, the teachers and school staffs and some of our friends were having lunch accompanied with some songs, sang by professional singer and our friends. We sang and danced together but i just only watched it. Then,the door prize was started ... mention some lucky numbers and my number, 4 was out as one of the Door Prize winner. After the Door prize was ended, we took some pictures together and after that, the program was ended. One by one the participants went home. The organizing committee including me went home later cleaning the place but some friends were still talked to each other in different place in a small group. That is my notes about the reunion of SMPN 245 Jakarta. Remembering from planning, discussing, organizing and running the reunion, it was a sweet and impressive program.